ANYWAY. 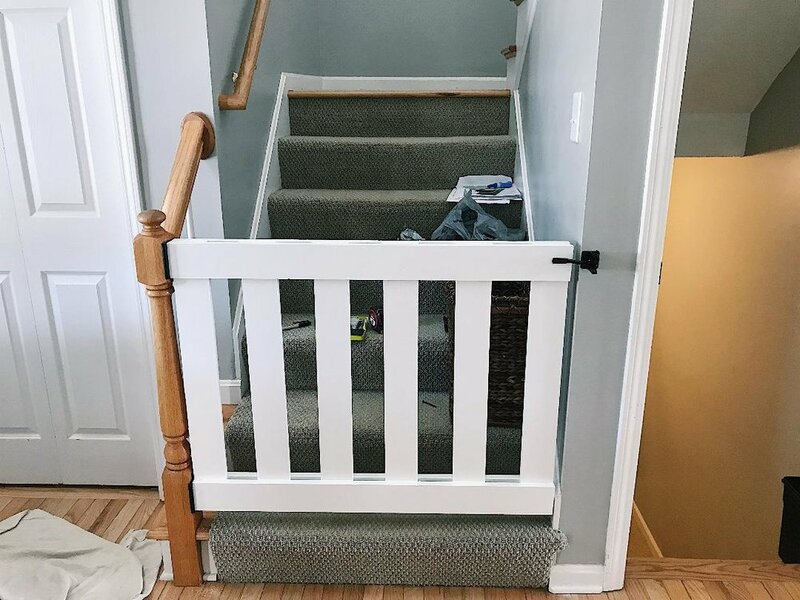 With having two flights of stairs, that we use all day long, I wanted a baby gate that I could operate one handed that would look halfway decent. 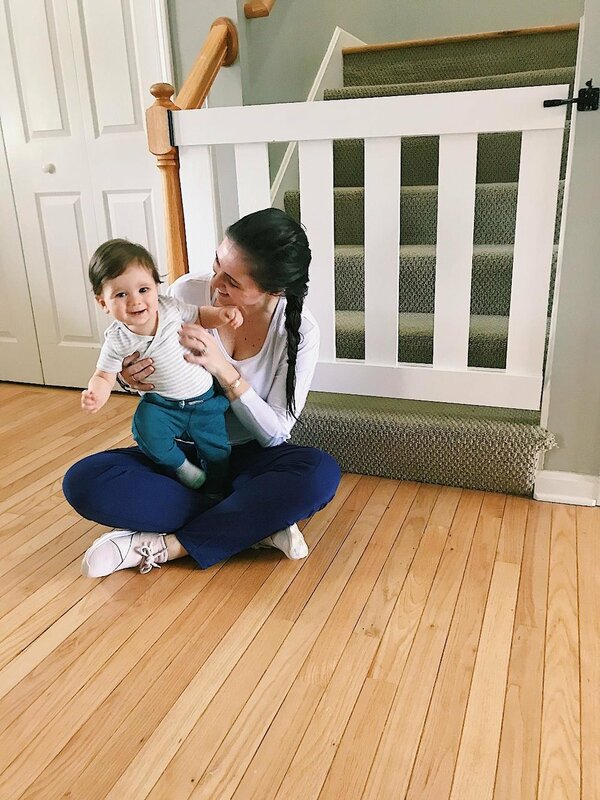 In theory, by the time Parker doesn’t need them anymore, there will be another little one that would, so these are going to be here a while. I couldn’t find any gates that didn’t cost a ton of money that still looked someone nice. So of course I decided to make some. These were one of the easier projects we’ve done, aside from hanging them. They were about $30 to make, not including the paint. Honestly, considering that included the hardware, that’s better than a lot of the premade gates cost. So step one was figuring out the height and width the boards needed to be. Fun fact, even though it’s the same stairwell, they may not be all the same spacing, courtesy of your construction team. We made three gates and all three had to be different sizes. We originally planned to use screws, but I am really loving this nail gun we bought this year, so that saved us a ton of time. We were able to have them assembled, once we were happy with the spacing, in a matter of minutes. 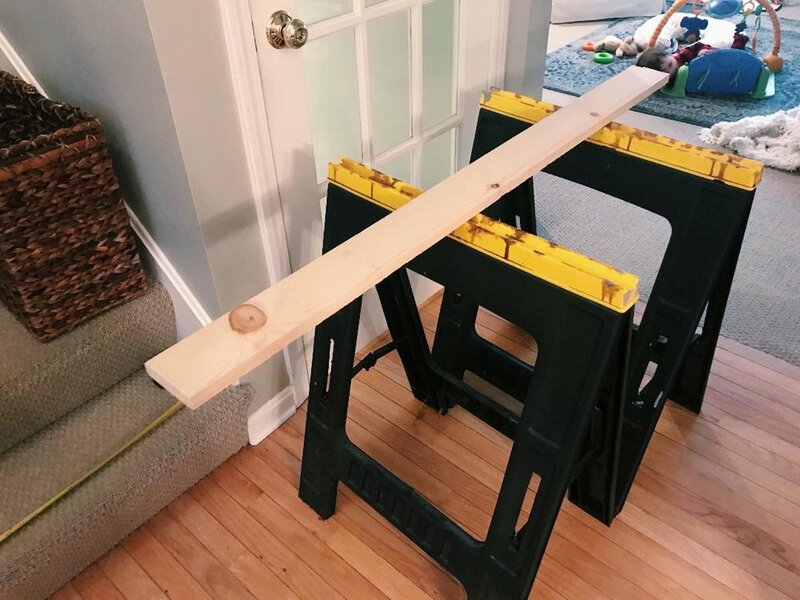 I placed the horizontal boards on both sides so that it had clean lines no matter if you were going up or down the stairs. Then all I did was putty and sand the holes prior to painting. Another tip about painting. We didn’t do this on the first gate, but decided to on the other two and it was much easier. It was simpler to paint most of the gate before attaching the second set of horizontal boards. That way you weren’t trying to squeeze your paint brush into the little gaps. I painted the final horizontal board before attaching it. Once it was all together it just needed a few touch ups. Technically an extra step, but WAY easier. Last up was to hang them! This was the harder part, each of our spaces was a little different so it took some thinking. I opted for some fence gate latches so that I can open or shut them one handed if I am carrying Parker, or anything else really. Like I said, we plan to have these up for years, so the 6 little holes it puts in the banister from the hinges don’t bother me. 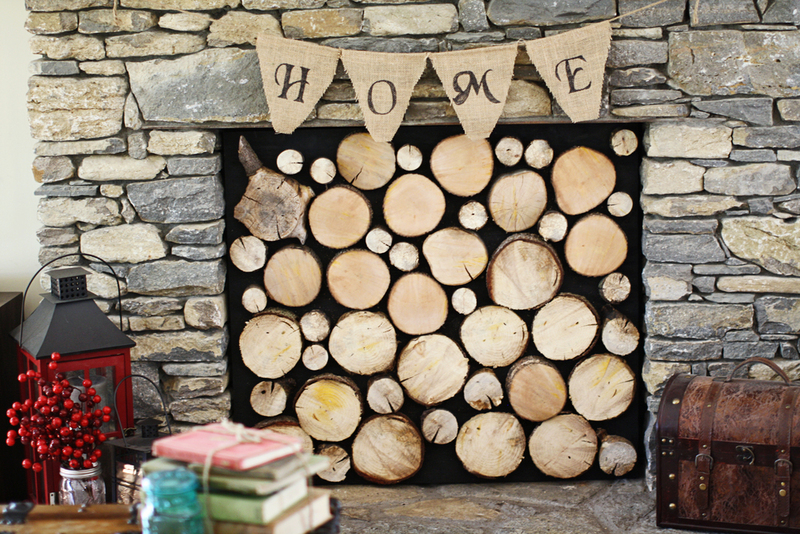 And they can always be wood puttied and stained. This is in the foyer going up the stairs. This is at the top of the stairs where the bedrooms are. And below is in our basement. Thankfully we have a basement door, so that kept us from needing four gates. These were so simple and I’m so happy with how they turned out! 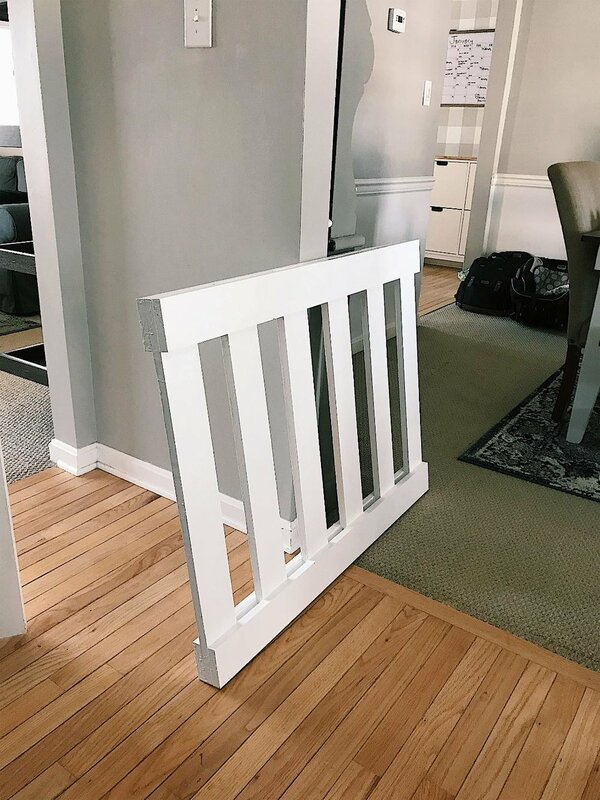 The hinges are in studs, so they can hang open with no problem, but they have already helped contain our curious little guy. Let me know if you have any questions on how to make these work for your space! Now to finish baby proofing and securing the rest of the house. Oy.